This streaked cultivar is the result of a cross of an H. 'Beatrice' seedling x H. 'Frances Williams' which was registered by Wm and Eleanor Lachman of Massachusetts in 1987. 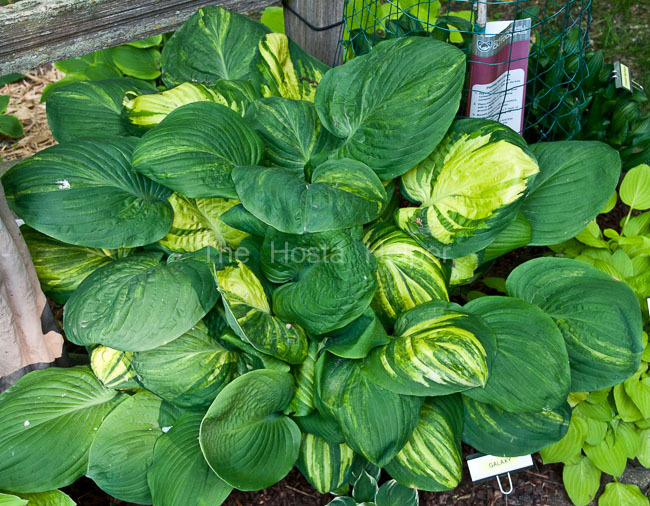 It forms a medium size hosta about 18 inches tall with a spread of around 40 inches. The broadly ovate leaves have a heart shaped base and have slightly wavy margins. Its medium lavender flowers bloom from late June into July followed by viable seeds. According to The Hostapedia by Mark Zilis (2009), "I've always thought 'Galaxy' to be an outstanding specimen plant in the garden, but it became a significant breeding plant for both Jerry Hadrava ("Rosedale" series) and Dr. Ed Elslager of Michigan." The New Encyclopedia of Hostas by Diana Grenfell (2009) states: "With yellow-leaved hostas it will produce a more jazzy effect. Easily reverts, so frequent division is necessary to retain the particularly attractive streaking and mottling. Among the best hostas with streaked leaves...Leaves can have large areas of the base color, but usually have more mottling than most streaked hostas." An article by Bob Solberg in The Hosta Journal (1994 Vol. 25 No. 2) states that "William and Eleanor Lachman crossed the better blues of Eric Smith with their own line of variegated 'Beatrice' and 'Flamboyant' hybrids to yield a large group of blue hostas with cream to white variegation - unlike any previously introduced: 'Cherub'...and 'Crusader'...both registered in 1989 are two examples of this breakthrough. Some may also consider the Lachman's earlier introductions of 'Carnival' and 'El Capitan' as breakthroughs for their substance and bright gold edges, although 'Galaxy', their streaked sibling, is of more value to hybridizers. All have 'Beatrice' and some 'Tokudama' in their pedigrees."